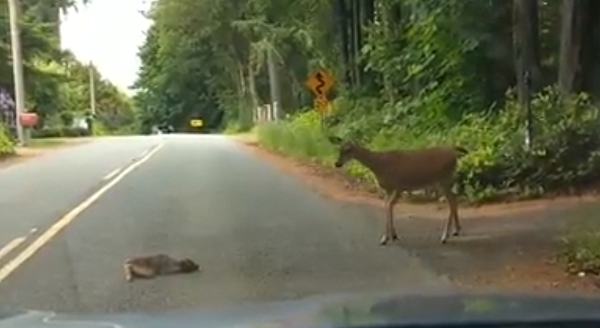 Frightened Fawn Plays Dead In Middle Of Road Until Sweet Mama Comes To The Rescue. We’ve all heard the expression “like a deer in headlights,” but it’s still a strange sight when you happen upon it yourself. 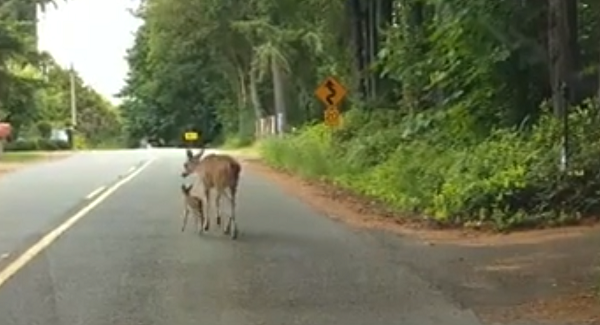 Jessie Larson of Bremerton, Washington, had just dropped off her daughter at daycare and was heading to work when she spotted a mother deer walking down the side of the road with her itty-bitty speckled fawn. Startled by the sound of Jessie’s car, the mama deer sprinted into the bushes. Her baby, however, was too frightened to run and instead dropped to the pavement and played dead. 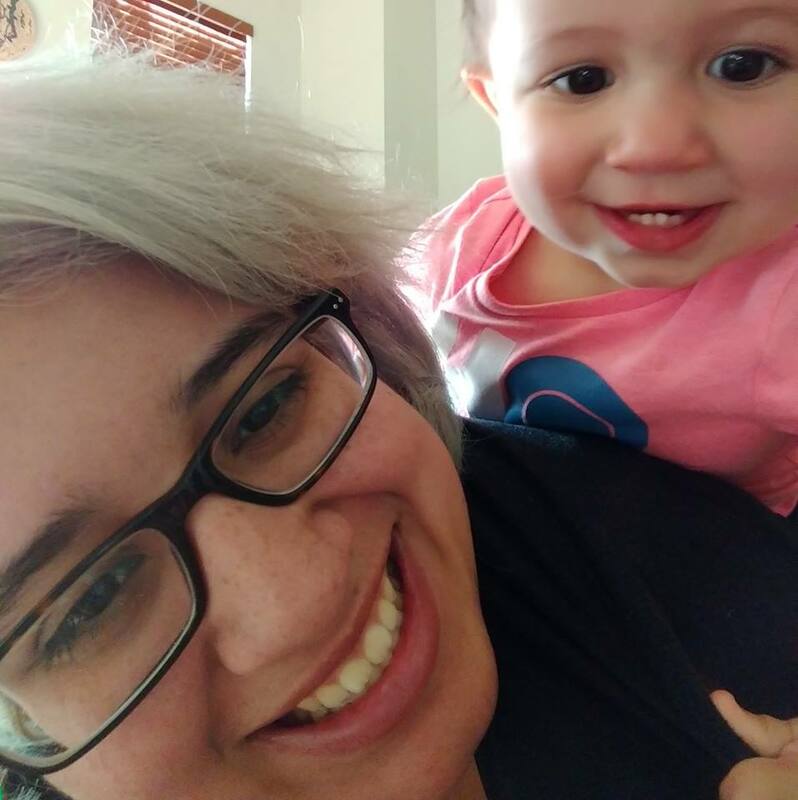 Jessie immediately put her car in park and waited for the baby to move, but after a few moments it became clear that he was far too frightened to move a muscle. After tooting her horn in hopes of startling him into action, Jessie finally decided to turn her car off to let the silence soothe him into moving. As soon as the fawn feels his mother’s kiss he begins to perk up. Seconds later, he’s back on his feet and tentatively following his mama down the street again. After Jessie continued on with her day she shared the video of her interaction with nature on Facebook. 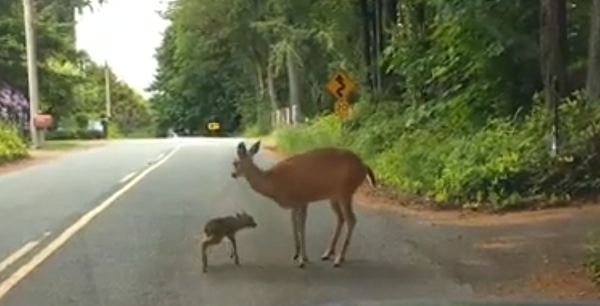 “Little guy got so scared, he just laid down on the road! 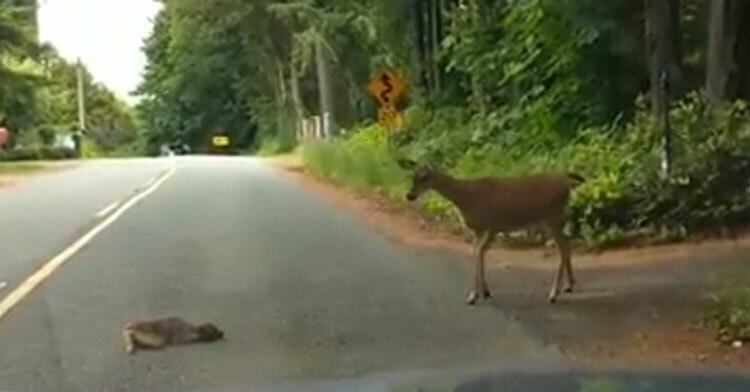 Turned my car off so Mama would come help…and yes, you hear me talking to the deer,” Jessie wrote. We’re so glad that Jessie was able to stop the car and allow this baby a chance to get out of harm’s way! We must all remember that we share this earth with other living beings. Being kind to animals is another way to demonstrate the basic human kindness that lies inside us all. Watch Jessie’s sweet video below and be sure to share with others! “Angel” On NYC Subway Buys All Of Flower Lady’s 140 Roses, But Has Special Request. Teacher Who Broke Neck In Front Of Students Inspires Them With “Miracle” Recovery.